Đạo Hòa Hảo (Vietnamese: [ɗâːwˀ hwàː hâːw] (listen), Chữ Nôm: 道和好), also Hoahaoism, is a lay-Buddhist organization, founded in 1939 by Huỳnh Phú Sổ (Popularly called Phật thầy, "Buddha Master" in Vietnamese), a native of the Mekong River Delta region of southern Vietnam. Adherents consider Sổ to be a prophet, and Hòa Hảo a continuation of a 19th-century Buddhist ministry known as Bửu Sơn Kỳ Hương (Sino-Vietnamese 寶山奇香). The founders of these traditions are regarded by Hòa Hảo followers as living Buddhas—destined to save mankind from suffering and to protect the Vietnamese nation. Hòa Hảo claims approximately two million followers throughout Vietnam; in some provinces near its Delta birthplace, as many as 90 percent of the population practice this tradition. An important characteristic of this movement is its emphasis on peasant farmers, exemplified by the old slogan, "Practicing Buddhism While Farming Your Land". Hòa Hảo stresses the practice of Buddhism by lay people in the home, rather than focusing primarily on temple worship and ordination. Aid to the poor is favored over pagoda-building or expensive rituals; religious and social ceremonies are ideally simple and modest, and are not to include the food offerings, divination services, and elaborate wedding and funeral customs found in some manifestations of Southeast Asian life. These are viewed as a waste of money which would be better spent helping the needy. Although Hòa Hảo Buddhism is an officially recognized religion in Vietnam, many members refuse the forceful governmental affiliation which is entailed by official recognition and an unknown number of religious leaders have been detained for this reason. Two Hòa Hảo Buddhists self-immolated in 2005 to protest against religious persecution and more recently, after a wave of arrests of Hòa Hảo Buddhists, nine more were imprisoned in May 2007. Hòa Hảoists reportedly do not believe their founder died under torture. They surmise that he is still among the living. In 2007, the Vietnamese government had the printed prophesies of the founder seized and reprinted to a volume slightly more than half the original size. The ceremonies commemorating the birth of this prophet were outlawed. Since then, Hòa Hảo split into two factions – more and less militant. The State of Vietnam referendum of 1955 determined the future form of government of the State of Vietnam, the nation that was to become the Republic of Vietnam (widely known as South Vietnam). It was contested by Prime Minister Ngô Đình Diệm, who proposed a republic, and former emperor Bảo Đại. Bảo Đại had abdicated as emperor in 1945 and at the time of the referendum held the title of head of state. Though published counts showed Diệm winning the election with 98.2% of the vote, the referendum was widely marred by electoral fraud. In the capital, Saigon, Diệm was credited with more than 600,000 votes, although only 450,000 people were on the electoral roll. He accumulated tallies in excess of 90% of the registered voters, even in rural regions where opposition groups prevented voting. The referendum was the last phase in the power struggle between Bảo Đại and his prime minister. Bảo Đại disliked Diệm and had frequently attempted to undermine him, having appointed him only because he was a conduit to American aid. At the time, the country was going through a period of insecurity, as Vietnam had been temporarily partitioned as a result of the 1954 Geneva Accords that ended the First Indochina War. The State of Vietnam controlled the southern half of the country, pending national elections that were intended to reunify the country under a common government. Still, the Vietnamese National Army was not in full control of southern Vietnam; the Cao Đài and Hòa Hảo religious sects ran their own administrations in the countryside supported by private armies, while the Bình Xuyên organised crime syndicate controlled the streets of Saigon. Despite interference from these groups, Bảo Đại, and even French officials, Diệm managed to subdue the private armies and consolidate government control over the country by mid-1955. Emboldened by his success, Diệm began to plot Bảo Đại's downfall. He scheduled a referendum for 23 October 1955 and pushed Bảo Đại out of the political scene, hindering the former emperor's attempts to derail the poll. In the period leading up to the vote, campaigning for Bảo Đại was banned, while Diệm's election campaign focused on personal attacks against Bảo Đại. These included pornographic cartoons of the head of state and unverified rumours claiming he was illegitimate and linking him to various mistresses. The government-controlled media launched polemical attacks on Bảo Đại, and police went door-to-door, warning people of the consequences of failing to vote. After his brother Ngô Đình Nhu successfully rigged the poll, Diệm proclaimed himself president of the newly created Republic of Vietnam. In 1955, the Prime Minister of South Vietnam Ngô Đình Diệm faced a severe challenge to his rule over South Vietnam from the Bình Xuyên criminal gang and the Cao Đài and Hòa Hảo religious sects. In the Battle of Saigon in April, Diệm's army eliminated the Bình Xuyên as a rival and soon also reduced the power of the sects. The United States, which had been wavering in its support of Diệm before the battle, strongly supported him afterwards. Diệm declined to enter into talks with North Vietnam concerning an election in 1956 to unify the country. Diệm called a national election in October and easily defeated Head of State Bảo Đại, thus becoming President of South Vietnam. In communist North Vietnam, Ho Chi Minh initiated a land reform program that was accomplished with many executions and imprisonments of "landlords." Ho was unable to get the support of China and the Soviet Union to press for preliminary talks that would lead to the 1956 elections called for in the Geneva Accord. Lê Quang Vinh (1923 – 13 July 1956), popularly known as Ba Cụt (Vietnamese: [ɓāː kût]) was a military commander of the Hòa Hảo religious sect, which operated from the Mekong Delta and controlled various parts of southern Vietnam during the 1940s and early 1950s. Ba Cụt and his forces fought the Vietnamese National Army (VNA), the Việt Minh, and the Cao Đài religious movement from 1943 until his capture in 1956. Known for his idiosyncrasies, he was regarded as an erratic and cruel leader who fought with little ideological purpose. His sobriquet came from the self-amputation of his left index finger (although it was erroneously reported that it was his middle or "third cut finger"). He later swore not to cut his hair until the communist Việt Minh were defeated. Ba Cụt frequently made alliances with various Vietnamese factions and the French. He invariably accepted the material support offered in return for his cooperation, and then broke the agreement—nevertheless, the French made deals with him on five occasions. The French position was weak because their military forces had been depleted by World War II, and they had great difficulty in re-establishing control over French Indochina, which had been left with a power vacuum after the defeat of Japan. In mid-1955, the tide turned against the various sects, as Prime Minister Ngô Đình Diệm of the State of Vietnam and his VNA began to consolidate their grip on the south. Ba Cụt and his allies were driven into the jungle, and their position was threatened by government offensives. After almost a year of fighting, Ba Cụt was captured. He was sentenced to death and publicly beheaded in Cần Thơ. Châu Phú is located 20 km south of Long Xuyên and 20 km north of Châu Đốc, the main towns in the province. The district comprises 12 communes and one thị trấn: Khánh Hòa, Mỹ Đức, Mỹ Phú, Ô Long Vĩ, Vĩnh Thạnh Trung, Thạnh Mỹ Tây, Bình Long, Đào Hữu Cảnh, Bình Phú, Bình Chánh, Bình Mỹ, thị trấn Cái Dầu. The majority of the population follows the Hòa Hảo religious sect. Châu Thành is a district (huyện) of An Giang Province in the Mekong Delta region of Vietnam. As of 2003 the district had a population of 171,480. The district covers an area of 347 km². The district capital lies at An Châu.It was created when the district Châu Thành X was split into Châu Thành and Thoại Sơn District, under decree 300/CP on August 23, 1979. Under South Vietnam, it was part of Long Xuyên Province. The district comprises the thị trấn An Châu (huyện lỵ) and 12 communes, which include a total of 63 hamlets. It borders four other districts, these being Tịnh Biên District, Châu Phú District, Chợ Mới, Thoại Sơn District and the nearby city of Long Xuyên. The terrain is flat, and is bisected by the Hau River. The ethnic groups in the area in order of size, are ethnic Vietnamese, Khmer Krom, Cham, and Hoa. Hòa Hảo is the most common religion in the area. The Chau Doc massacre was the July 11, 1957 killing of 17 people in the small town of Châu Đốc in An Giang Province, near the border with Cambodia, in what was then known as South Vietnam. The killings were part of a low-level campaign targeting South Vietnamese officials. Chợ Mới is a rural district (huyện) of An Giang Province in the Mekong Delta region of Vietnam. As of 2003 the district had a population of 362,492. The district covers 355 km². The district's capital lies at Chợ Mới.In addition to the district capital Chợ Mới, there is one other urban subdivision, thị Trấn Mỹ Luông. The rural communes are: Kiến An, Kiến Thành, Mỹ Hội Đông, Nhơn Mỹ, Long Giang, Long Điền A, Long Điền B, Tân Mỹ, Mỹ Hiệp, Bình Phước Xuân, Long Kiến, An Thạch Trung, Hội An, Hòa Bình and Hoà An. The district is heavily criss-crossed by waterways in the delta, causing the district to consist of small islands. Hòa Hảo, Cao Đài, Protestantism and Roman Catholicism are the main religions. Chợ Thủ is a village in Chợ Mới District, An Giang, Vietnam. Chợ Thủ is located in Long Điền A, Chợ Mới district, An Giang Province, on the road from town to town Mỹ Luông, Chợ Mới. This is a place with long history, is formed in the process of clearing wasteland of Nguyễn Hữu Cảnh. It is also one of the cradles of Hòa Hảo Buddhism. Dương Văn Minh (Vietnamese: [zɨəŋ van miŋ̟] (listen); 16 February 1916 – 6 August 2001), popularly known as Big Minh, was a South Vietnamese politician and a senior general in the Army of the Republic of Vietnam (ARVN) and a politician during the presidency of Ngô Đình Diệm. In 1963, he became chief of a military junta after leading a coup in which Diệm was assassinated. Minh lasted only three months before being toppled by Nguyễn Khánh, but assumed power again as the 4th and last President of South Vietnam in April 1975, two days before surrendering to North Vietnamese forces. Despite being a communist country, Vietnam is widely known for its tolerance towards religion. The Constitution of Vietnam officially provides for freedom of worship, while the government has imposed a range of legislation restricting religious practices. Huỳnh Phú Sổ (Vietnamese: [hʷɨ̀n fǔ ʂô]; January 15, 1920 – April 16, 1947), popularly known as Đức Thầy (lit. "Virtuous Master") or Đức Huỳnh Giáo Chủ (lit. Virtuous [Sect] Founder Huynh), was the founder of the Hòa Hảo religious tradition. The Mặt trận Quốc gia Thống nhất (National Unified Front) was a Vietnamese political alliance in the short-lived Empire of Vietnam. It was formed August 14–17, 1945 in Southern Vietnam uniting all non-Viet Minh factions, including Trotskyites and the southern religious sects of Cao Đài and Hòa Hảo. Following the delayed arrival in Saigon on August 22, 1945 of the former president of the Journalists' Syndicate, and now Imperial Commissioner of Nam Bo Nguyen Van Sam, the alliance made an official declaration of national independence and territorial reunification.The Front initially had its own paramilitary unit, the Advanced Guard Youth, which was under the leader of Dr. Phạm Ngọc Thạch. However Thạch led the unit over to the Viet Minh after the abdication of the Emperor Bảo Đại.The leading role of the Trotskyite faction was brief and became irrelevant as leaders such as Phan Văn Chánh (d.1945) and Phan Văn Hùm (d.1946) were murdered or disappeared. Nguyễn Ngọc Thơ (26 May 1908 – 12 June 1976) was a Vietnamese politician who was the first Prime Minister of South Vietnam, serving from November 1963 to late January 1964. Thơ was appointed to head a civilian cabinet by the military junta of General Dương Văn Minh, which came to power after overthrowing and assassinating Ngô Đình Diệm, the nation's first president. Thơ's rule was marked by a period of confusion and weak government, as the Military Revolutionary Council (MRC) and the civilian cabinet vied for power. Thơ lost his job and retired from politics when Minh's junta was deposed in a January 1964 coup by General Nguyễn Khánh. The son of a wealthy Mekong Delta landowner, Thơ rose through the ranks as a low-profile provincial chief under French colonial rule, and he was briefly imprisoned by Imperial Japan when they invaded and deposed the French during World War II. During this time he met Minh for the first time as they shared a cell. Following World War II, he became the Interior Minister in the French-backed State of Vietnam, an associated state in the French Union. After the establishment of the Republic of Vietnam in 1955 following the partition in 1954, Thơ was sent to Japan as ambassador and secured war reparations. Recalled to Vietnam within a year, he helped to dismantle the private armies of the Hòa Hảo religious sect in the mid-1950s. Tho led the political efforts to weaken the Hòa Hảo leadership. While Minh led the military effort, Thơ tried to buy off Hòa Hảo leaders. 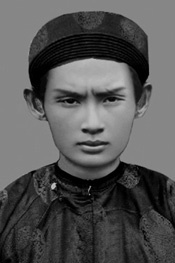 One commander, Ba Cụt, was personally hostile to Thơ, whose father had confiscated the land of Ba Cụt's family decades earlier. The stand-off could not be ended peacefully in this case, and Ba Cụt was captured and executed. This success earned Thơ the vice presidential slot in December 1956 to widen the popular appeal of Diệm's nepotistic and sectarian regime. It was reasoned that Thơ's southern heritage would broaden the regime's political appeal—Diệm's family was from central Vietnam and most administrators were not from South Vietnam. Thơ was not allowed to take part in policy decisions and had little meaningful power, as Diệm's brothers, Nhu and Cẩn, commanded their own private armies and secret police, and ruled arbitrarily. Thơ oversaw South Vietnam's failed land reform policy, and was accused of lacking vigour in implementing the program as he was himself a large landowner. He was noted for his faithful support of Diệm during the Buddhist crisis that ended the rule of the Ngô family. Despite nominally being a Buddhist, Thơ defended the regime's pro-Roman Catholic policies and its violent actions against the Buddhist majority. Thơ turned against Diệm and played a passive role in the coup. Upon the formation of the new government, he struggled to keep the nation under control as the MRC and civilian cabinet often gave contradictory orders. Media freedom and political debate were increased, but this backfired as Saigon became engulfed in infighting, and Thơ had a series of newspapers shut down after they used the new-found freedom to attack him. During that time, South Vietnam's military situation deteriorated as the consequences of Diệm's falsification of military statistics and the misguided policies that resulted were exposed. Minh and Thơ had a plan to try to end the war by winning over non-communist members of the insurgency, believing that they constituted the majority of the opposition and could be coaxed away, weakening the communists. As part of this policy, which the U.S. opposed, the government chose to take a low-key military approach in an attempt to portray themselves to the Vietnamese public as peacemakers. However, they were deposed in Khánh's U.S.-backed coup before they could pursue their strategy. Phú Tân is a rural district (huyện) of An Giang Province in the Mekong Delta region of Vietnam. As of 2003 the district had a population of 237,965. The district covers an area of 307 km². The district capital lies at Phú Mỹ.Phú Tân is the homeland of the Hòa Hảo Buddhism religion. Long-established religions in Vietnam include the Vietnamese folk religion, which has been historically structured by the doctrines of Confucianism and Taoism from China, as well as a strong tradition of Buddhism (called the three teachings or tam giáo). According to official statistics from the government, as of 2014 there are 24 million people identified with one of the recognised organised religions, out of a population of 90 million. Of these, 11 million are Buddhists (12.2%), 6.2 million are Catholics (6.9%), 4.4 million are Caodaists (4.8%), 1.4 million are Protestants (1.6%), 1.3 million are Hoahaoists (1.4%), and there are 75,000 Muslims, 7,000 Bahá'ís, 1,500 Hindus and other smaller groups (<1%). Traditional folk religions (worship of gods, goddesses and ancestors) have experienced a rebirth since the 1980s.According to estimates by the Pew Research Center in 2010, most of the religious Vietnamese practiced folk religions (45.3%). 16.4% were Buddhists, 8.2% were Christians (mostly Catholics), and about 30% were unaffiliated to any religion. Officially, the Socialist Republic of Vietnam is an atheist state as declared by its communist government. The Viet Nam Democratic Socialist Party (Vietnamese: Đảng Dân chủ Xã hội Việt Nam) was a political party in South Vietnam. It was founded in 1944 by Huỳnh Phú Sổ, the founder of Hòa Hảo. The party was formed through the unity of a sector of socialist-minded people in Saigon and some provincial sect leaders. The party was persecuted by the Việt Minh. Huỳnh Phú Sổ was killed by the Việt Minh in 1947, after which the party was dissolved. In February 1955, General Nguyễn Giác Ngộ of Hòa Hảo claimed that the party had been revived. The party obtained three seats in the 1959 National Assembly election. Đạo Bửu Sơn Kỳ Hương (寶山奇香, Vietnamese: [ɗâːwˀ ɓɨ᷉w ʂəːn kî hɨəŋ], "Way of the Strange Fragrance from the Precious Mountain") refers to a religious tradition originally practiced by the mystic Đoàn Minh Huyên (1807–1856) and continued by Huỳnh Phú Sổ, founder of the Hòa Hảo. The phrase itself refers to the Thất Sơn range on the Vietnamese-Cambodian border, where Huyên, claiming to be a living Buddha sent into the world to rescue humankind, and accepted as such by followers of Hòa Hảo, is said to have made his first appearance in 1849.